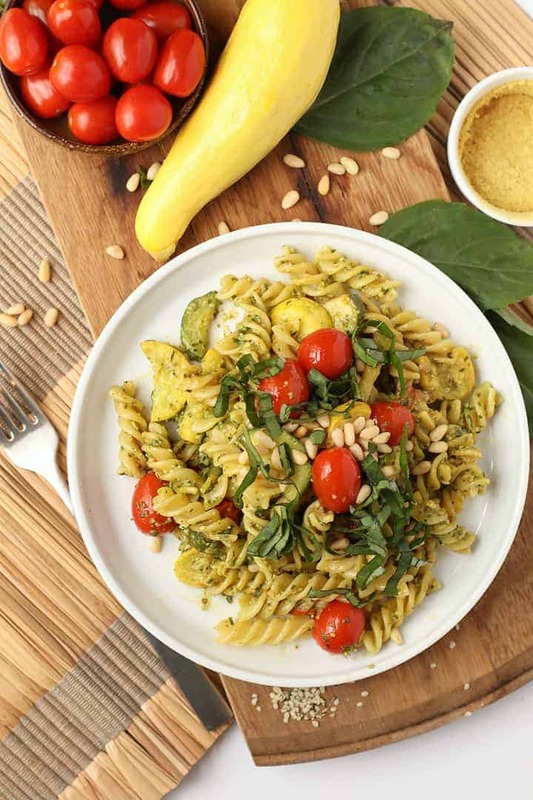 This vegan Pesto Pasta is tossed with sautéed summer squash, zucchini, and cherry tomatoes for a light and refreshing dinner that can be enjoyed all summer long. Who else has been enjoying gardening this April? Last year, in an attempt to get my children more excited about vegetables, I started gardening with them. 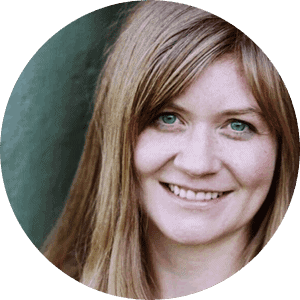 My then-3-year-old was more interested in playing in the dirt of the unused garden beds, but my 5-year-old loved planing the seeds, watering them daily, and watching little edible things grow from the ground. I didn’t put much effort into my garden last year, growing mostly kale and snap peas but the experience was enough to turn my vegetable-hating daughter into a kale and snap pea lover. This year I’m taking it further, hoping for the same effects on my son. Although it makes it a bit more difficult to plant small seeds and delicate starts with an energetic 4 and 6-year-old, I have given them each a set of gardening tools and whenever it’s time to do something to the vegetables, we do it together. All for the love of vegetables. To honor the beginning of gardening season, I am sharing with you this vegan Pesto Pasta with Zucchini and Summer Squash. As you may know, I love my vegan pasta. Among my favorite pasta recipes are this Vegan Pasta with Roasted Cherry Tomatoes and this One Pot Garlic White Wine Pasta with Peas. And despite not being able to use garden-fresh veggies yet, this Vegan Pesto Pasta with Summer Squash recipe is now among my favorite spring and summertime meals. That’s it! Ingredients you likely already have on hand. Better yet, this vegan pasta is very versatile. Feel free to swap out the Fusilli pasta for any other kind of pasta. Additionally, you can swap pesto for marinara sauce. 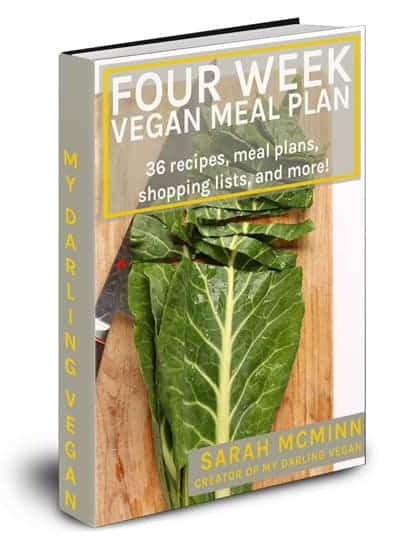 As I mentioned, this vegan pasta recipe is super simple to make. 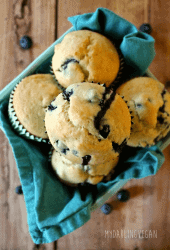 It can be made in just about 30 minutes with minimal prep. Add all the ingredients, except the olive oil, to a food processor and blend together. With the motor running, add the olive oil into the blender in a slow and steady stream. Once all the olive oil is incorporated, stop to scrape down the sides of the food processor with a spatula. Process a little bit longer until you have a bright green, thick and creamy pesto. Next, let’s prepare the pasta. 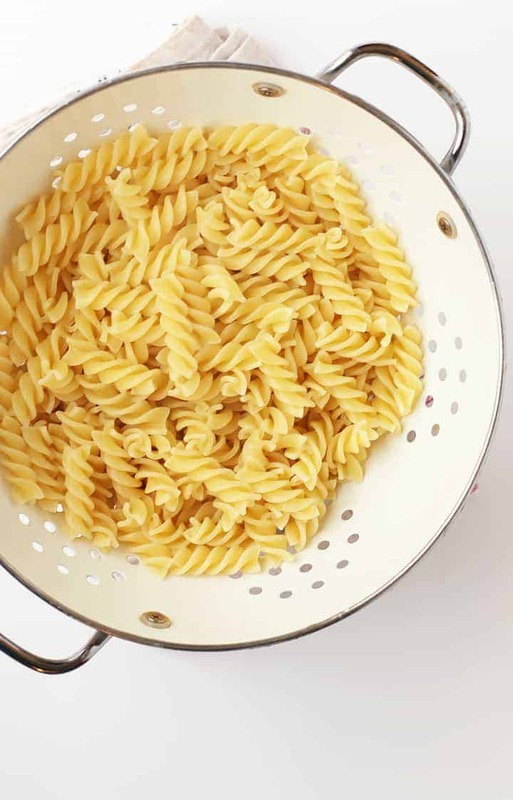 Cook the fusilli in a large pot of boiling water. When the pasta is done, strain it through a colander and toss it with a bit of olive oil. This prevents the noodles from clumping together. Heat oil in a large skillet. 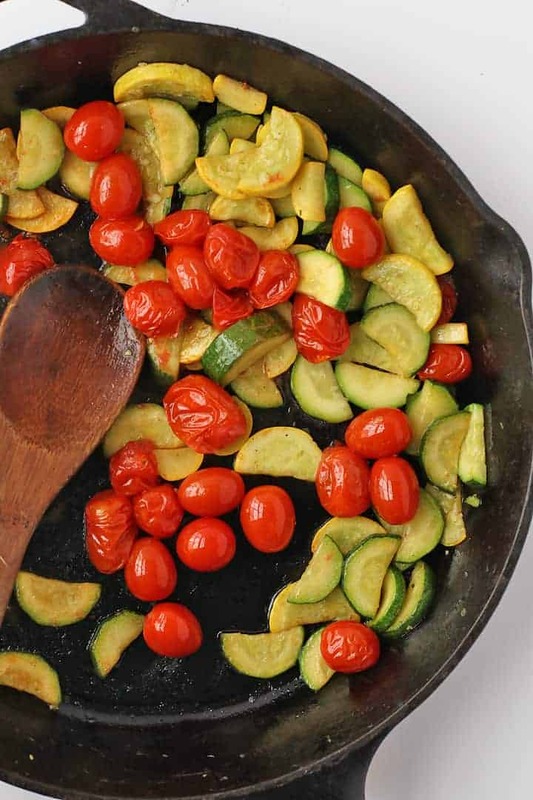 Once the oil is hot, add the summer squash, zucchini, and tomatoes. Sauté, stirring occasionally, until zucchini and squash have cooked all the way through and tomatoes have begun to burst open. Remove from heat. Add the cooked pasta and pesto to the sautéed veggies. Stir until it well combined. Top with fresh basil and pinenuts and serve! Can this vegan pasta be gluten-free? Sure! 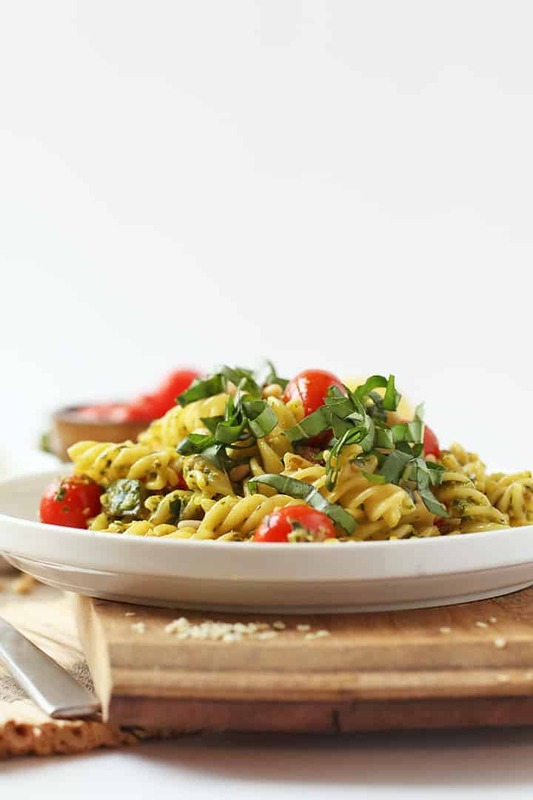 Just swap out the fusilli for gluten-free pasta and you have yourself a gluten-free pasta recipe. This is my favorite brand of gluten-free pasta. 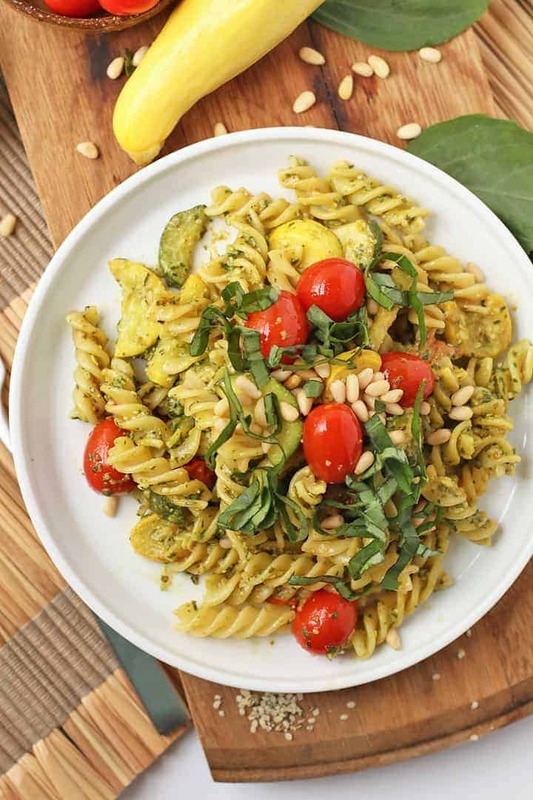 Serve the vegan pesto pasta immediately with fresh basil and roasted pinenuts. 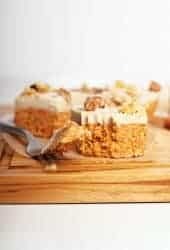 Serve with crusty bread and a vegan caesar salad. Store leftover pasta in an airtight container in the refrigerator for up to 3 days. To reheat, gently reheat the pasta over the stove with 1-2 tablespoons of water. Leftover pesto can be stored in an airtight container in the refrigerator for up to one week. You can also freeze pesto for up to six months. To freeze pesto, freeze it in ice cube trays. Once the pesto is frozen solid, transfer the cubes to a ziplock bag. When ready to use, just add the pesto to your pasta or vegetables to heat. Well, that’s it! 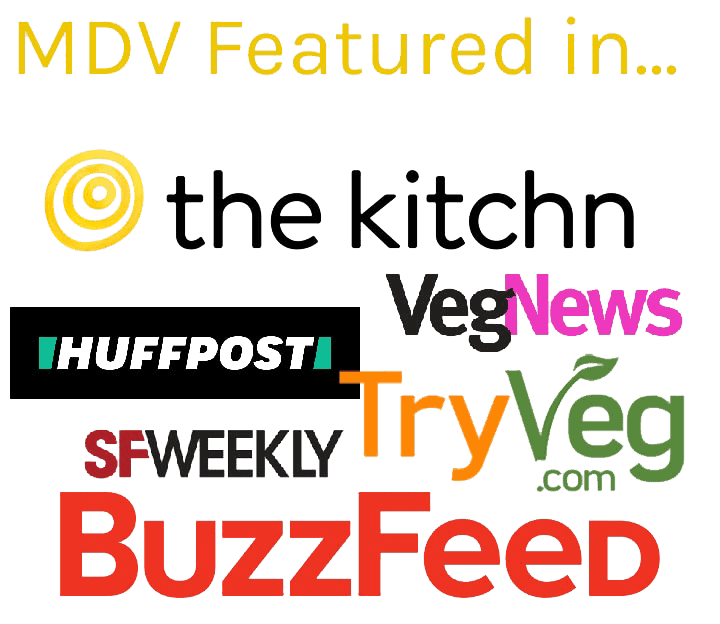 Everything you need to make the perfect vegan pasta recipe. Ready to get started? Let’s take a look at the recipe card below. Bring 2 quarts of water to boil and add fusilli pasta. Cook, uncovered, for 7-9 minutes until pasta is al dente. Remove from heat, strain through a colander, and set aside. While pasta is cooking, heat oil in a large cast iron skillet over medium-high heat. 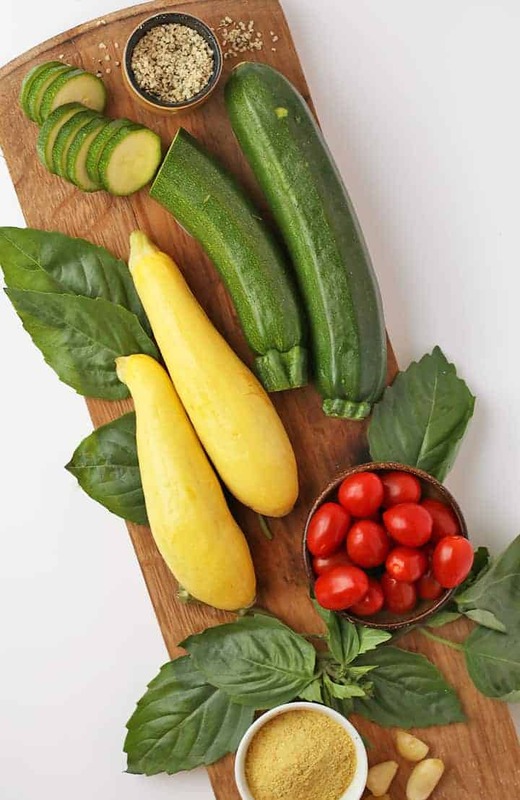 Once the oil is hot, reduce heat to medium and add summer squash, zucchini, and tomatoes. Sauté, stirring occasionally, until zucchini and squash have cooked all the way through and tomatoes have begun to burst open. Remove from heat. 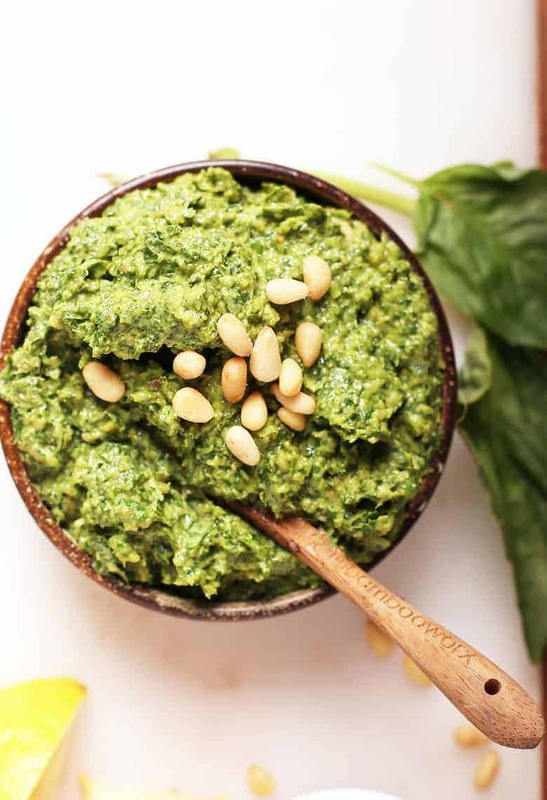 While vegetables are sautéing, place all the ingredients for the basil pesto EXCEPT the olive oil, in a food processor and blend until smooth. With motor running, slowly add the olive oil until it's completely incorporated. With the vegetables still in the skillet, add pasta and pesto and stir together. 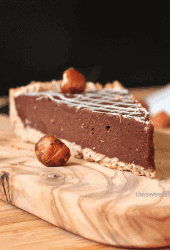 Serve immediately with toasted pine nuts and fresh basil (optional).